The Cogburn Outdoors bike is advertised as a helpful mode of transportation for hunting over long distances. The bike industry rarely breaches into the hunting world. But this week a brand announced a bike made for bow and rifle hunters who want to roll through the woods. Called Cogburn Outdoors, the brand is a division of Minnesota-based Quality Bicycle Products. The bike has 3.8-inch-wide “fat” tires and a camouflage motif with RealTree’s Xtra pattern type. 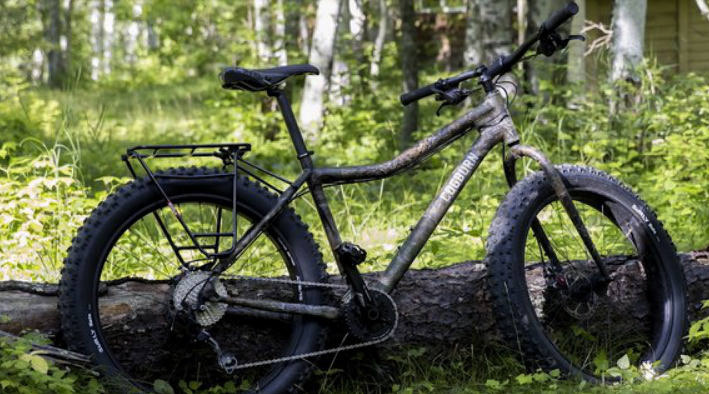 Quality Bicycle owns fat-bike brands Surly and Salsa. Both have spiked in popularity with winter riders and people who pedal on sand. With Cogburn ( www.cogburnoutdoors.com), the company hopes to appeal to “people looking to hunt, fish and forage in remote places,” as a tag line puts it. The bike model is called the CB4. There’s a rack on the back with a place to stow a rifle or a bow. It has an aluminum frame and disc brakes. The rims, handlebar and cranks are a no-glare black color for extra stealth in the woods. The bike is meant to transport a hunter into the wilds. Obviously, you won’t shoot or pursue game from the saddle. But instead of hiking in on trails, the bike ostensibly will let you pedal and coast the miles to a hunting grounds or a deer stand. It’s an interesting concept, no doubt. Cogburn hopes to find a market with a demographic of hunters who may see a nonmotorized option appealing. But with a price tag of $2,199, the Cogburn will be a stiff sell for many hunters. Its wide tires will roll over logs and float through mud and sand. Dragging a deer or elk out after the hunt is another scenario altogether.